Put the ham, Kingdom cheese, tomato and chives in a bowl and mix together well. 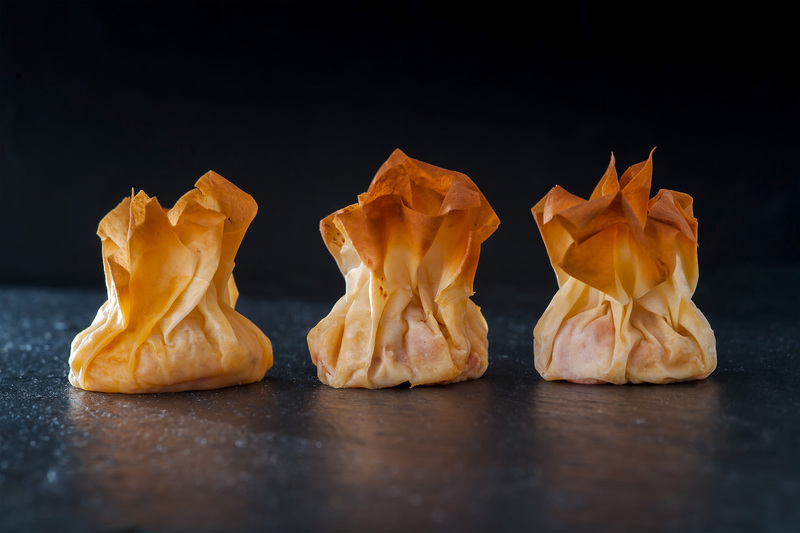 Cut the filo pastry into 24 pieces 7inches square carefully laying them on top of each other as you do so. Cover with a clean cloth to prevent drying out. Lay one 7 inch square on a flat surface, brush with melted butter then lay another square diagonally on top to form a star shape and brush it too with butter. Put a mound of the cheese mixture in the centre of the star then bring up the edges and pinch together to form the purse shape. Repeat this process with the remaining ingredients to make 12 parcels. Place them on a greased baking sheet and bake in a pre-heated oven at 350F for 5-8 minutes until golden brown.